Puerto Rico has gone through the worst hurricane since 1928, leaving our island in critical condition. Although recovery efforts are ongoing, the process is slow and will require a lot of help for the island to get back on its feet as this has been devastating for PR. We, a group of Puerto Ricans, professors, and a postdoc, at the University of California Davis, got together and would like to contribute to Puerto Rico’s recovery efforts and humbly ask the UC community as well as others in our networks to please help us reach our goal by donating to our campaign. Our campaign will be focused towards providing solar power and lights to the people of Puerto Rico. We will send 100% of the proceeds from this GoFundMe campaign to Casa Pueblo. Casa Pueblo is a Community Based Organization that started in 1980 in Adjuntas PR. In 2002, they were awarded the Goldman Environmental Prize. Since Hurricane María they have been leading a solar light project that has been distributing these to the most needed residents especially those in the mountain region of PR. For this initiative, they are asking people to donate: lightbulbs, chargers, money or purchase a light from Luminaid. We will be collecting the funds of this campaign as a check and we will utilize all of those funds to purchase solar lights and/or support the "#50%con sol" initiative. Please help us reach our goal to help our brothers and sisters in Puerto Rico. Any amount helps. José Juan Pérez Meléndez, Ph.D. It's been 59 days since hurricane María hit Puerto Rico and only ~30% of the island has electricity and ~80% have water. Recovery has been going slow but people remain optimistic. Because we know from our family and friends back home how bad the situation is we will do a final fundraiser event and promote the campaign as much as we can to try to get closer to our goal of $10,000. We will close this campaign next month and immediately send the funds to the organizations we have chosen (described in our 1st update). Finally, our last fundraising event, at Sudwerk, went great. We're currently waiting for the funds and once we receive the check we will give you an update. Thanks for all your support and please help us spread the word by sharing this campaign if you can. National Weather Service report on Hurricane María’s path through Puerto Rico which included high winds and the formation of 3 tornadoes in Yabucoa, PR. Each tab in their report has additional information and pictures. 90% of people have water in the metropolitan area, San Juan. The rest of the island is ~80%. *This report is in Spanish because it is from one of the local newspapers in Puerto Rico. Troops start to leave the island and there’s still a lot of work to do. 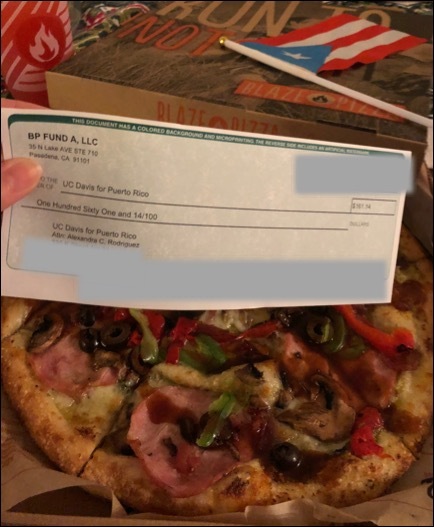 We have received the check from our first fundraiser that took place at BLAZE pizza in Davis and the total is $161.14 (picture below). We are very excited about this because with that we have reached $7,000!!! 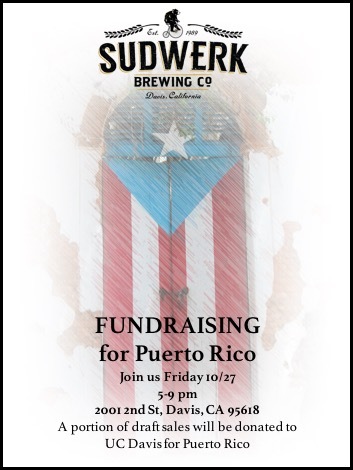 Today we will be doing our second fundraiser and this time it will be at Sudwerk Brewery in Downtown Davis from 5-9 pm. Join us if you can! They will be donating 25% of the sales to this campaign. Thanks for all your support and we will be updating you soon on our next plans. 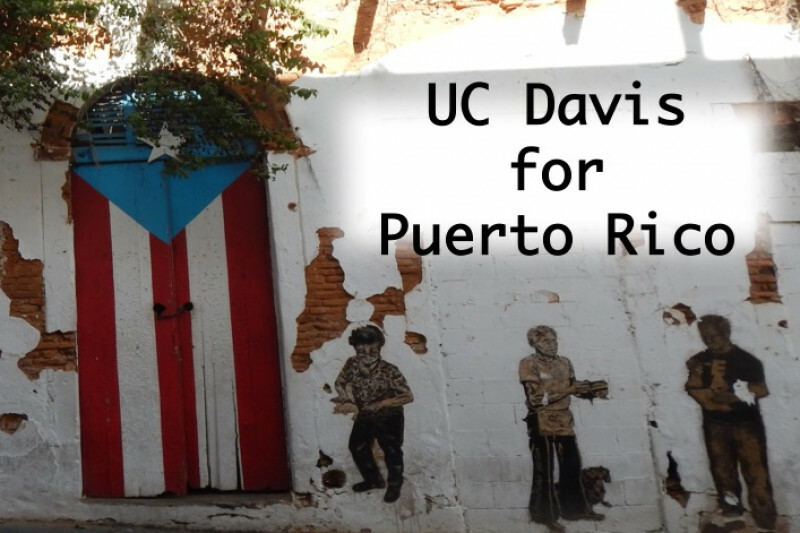 We, UC Davis for Puerto Rico team, are just accepting donations through this GoFundMe campaign because that will allow us to send the money directly to the organizations that are working in Puerto Rico. If we collect non-monetary donations we will need to identify sources to help with storage, shipping, and distribution when it gets to Puerto Rico. That all involves some sort of cost and we prefer for the funds to have a more direct impact by sending it directly to the organizations that are already working there. Currently, more than 30 days post-hurricane María, there continue to be significant issues with logistics of distribution of donations in Puerto Rico and we would like to avoid dealing with this issue. Finally, we will continue to be transparent about our efforts as we continue to seek ways to fundraise and once we have reached our goal, we will update on the donation status and upload the receipts/transactions once the donation has been made. We believe that by keeping the process transparent the people can feel confident about donating and trusting that we will be using the funds solely for the purpose stated. Below you will find the links to two press releases about our campaign in Davis local and digital newspapers. Thanks for all your support and please share our campaign if you can! Puerto Rico needs the help. First, thank you for all your support for this campaign! Last week, October 10th, UC Davis published the initiative it has launched to help students and faculty from Puerto Rico affected by hurricane María. This is the result of the hard work of our team and the UC Davis administration. We are extremely grateful for the response from the UC Davis community to help make this a reality. We are currently working on the logistic aspect of this initiative and will keep you posted on this and the plans for fundraising as we continue working hard to reach our goal of $10,000. Our team (mentioned above) refers to a group of Puerto Rican professors and a postdoc, which most are also part of this campaign and all have supported it. Their names and affiliations are below. Javier E. López, M.D., M.A.S. Thanks again for your support and please continue to share our campaign if you can to help us reach our goal.